DevOps. Net Neutrality. A/B testing. These are just a few words that the tech industry is buzzing with. Over the years, a few key phrases became so popular, that now they are used almost everywhere. However, many of them appear in the wrong context, resulting in sometimes ridiculous job descriptions or even memes. 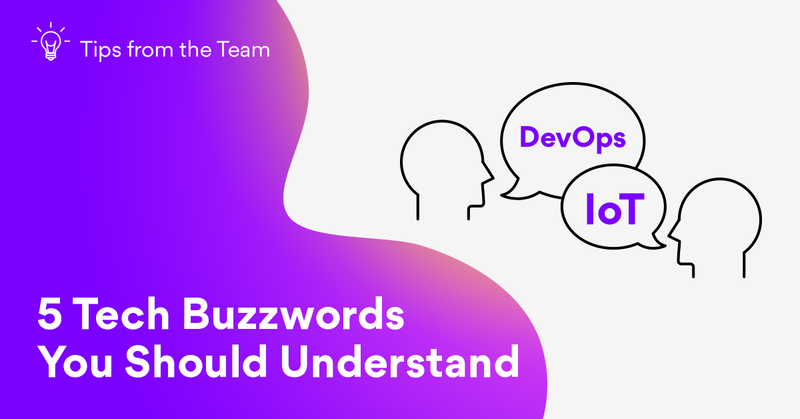 So this week, we’re explaining 5 most common tech industry buzzwords that every tech enthusiast should understand. The first buzzword in the list is growing in popularity and probably is one of the most misused. DevOps sounds fancy and cool, so many companies and recruiters are jumping in by adding this term to their job descriptions without really trying to understand what it means. Many are looking for DevOps Engineers or add a requirement to know DevOps tools. The problem with that is… There are no such things. DevOps is a discipline that was inspired by Agile development. While Agile mostly focuses on creating a more efficient workflow just for developers, DevOps looks into how devs and IT guys (system engineers, SysAdmins, DBAs, QAs, etc.) could work together to create a smoother transition from the development environment to the testing/production stage. There aren’t specific set of tools or rules, instead, it’s a mindset and collaboration between the two key teams. Before DevOps, both IT guys and devs usually weren’t communicating that much. They would use tools and techniques that work just for them, not thinking about how it might affect the overall deployment and release. The lack of communication between the two would result in unawareness of the roadblocks, not understanding business purposes and finger-pointing when something wouldn’t work. With methodologies like Agile becoming more popular and showing that software companies have to adapt to a fast-paced environment, DevOps became more admired and accepted by developers. Now cross-functional teams are empowered to build processes that are automated, transparent and fault-proof. The automation of business processes is a never-ending quest for years now. Companies are constantly looking for ways to automate the most tedious tasks that people used to do. Formulating email responses, transferring data or even creating custom software to ease business operations – the aim is to optimise and automate all the processes possible. Gartner points out that RPA market will achieve $1 billion in the upcoming 2 years, so there’s no doubt that this is the next big technology thing. But how exactly does RPA work? Well, it isn’t as much as a specific technique, as it’s an application of technology to serve business logic and its processes. Companies can configure software or “robot” by using RPA tools to capture and interpret various scenarios, and how they could be automated. The main benefits of RPA are reduced human errors, an ability to be more efficient and do more, without increasing headcount or costs. You’ve probably heard this term before or have seen the “IoT” abbreviation somewhere. No doubt this is probably one of the most common buzzwords used in IT & tech. In a nutshell, the Internet of Things is all about connecting different systems and using technology to improve the quality of life. Physical world will become one huge information system where everyday things will be connected to the Internet, in order to obtain information and create the best experience for people. This includes connecting computing devices, digital and mechanical machines, animals, objects and people that have unique identifiers (UIDs), so that to transfer data human-to-human and human-to-computer interaction won’t be required anymore. As a result, societies will become even more advanced and will create Internet-connected reality. It might sound pretty far-fetched or just as a summary of all Black Mirror episodes, but this Internet-connected reality is already taking shape. Many businesses and organizations are already thinking about how they can use IoT to be more efficient, improve customer experience and grow companies. In 2018, several Three Square Market employees voluntarily got chips injected into their hands. They use it to ease tasks like paying at the vending machines, logging into their computers or get into the office. Of course, not every case of IoT usage sounds so scary. Things like heart monitor implants, cars with built-in sensors to alert the drivers and many other objects that have an IP address assigned and can transfer data, are also common examples of IoT. As the trendiest of all buzzwords, blockchain even appears in many different memes. Though jokes about investors pouring money into whatever startups that involve blockchain are funny, it only goes to show how these types of buzzwords are losing their true value. Invented in 2008, blockchain served as a sort of account book to the bitcoin. Bitcoin (also a very trendy term, we might add), is a system of currency not relying on banks, countries or outside institutions. This system is especially useful to people in developing countries that suffer from such issues as hyperinflation, not being able to exchange their currency or having to deal with black market in order to exchange. To make sure that all these currency exchanges are secure and safe, bitcoin is built on the blockchain that keeps a record of each transaction made using bitcoin. The records are transparent to everyone and people using this currency know they’re not being ripped off. These blocks of transaction information are just like bank statements giving people all the information they need to know. Because of the blockchain structure, it’s difficult to do any fraudulent activities with the currency. So, as a result, such institutions as banks started using blockchain technology to secure large payments and protect data. In 2016 October, Wells Fargo and The Commonwealth Bank of Australia were the first to use blockchain to pay for the shipment of cotton from the U.S. to China. Today, more businesses are looking into ways to use blockchain to secure even simple everyday tasks, like online shopping. With the growing number of services and products provided online, the need to ensure equality across the Internet increased. So back in 2003, the principle of Net Neutrality was introduced. The concept states that Internet Service Provider or the government should treat all data transferred over their network the same way. They can’t discriminate or charge users differently based on user, website, platform, application, content or else. For instance, if there wasn’t Net Neutrality, an Internet Service Provider could prioritize the traffic of their music streaming service over Spotify’s. This would mean that you couldn’t listen to Spotify in the area since the service would be terrible and you would be forced to use Internet Provider’s service. Though this term isn’t new, the question of it is always raised when debating the ethics of Internet service business and protection of equality. In 2010, the Federal Communications Commission (FCC) attempted to fight various threats to reinforce Net Neutrality with a set of Open Internet rules. However, the rules were full of legal and practical holes and in 2014, they were overturned. A year later, the FCC tried again with newly produced regulations, but the new Chair of FCC repealed them, despite large resistance from the community. This doesn’t mean though, that Net Neutrality is dead. Today, Democrats in the U.S. are fighting hard for the protection of Net Neutrality and to create a single legislative solution for it. According to them, the Internet promises innovation, freedom and creativity and there shouldn’t be gatekeepers to take that away.